One area of historical research I’ve pursued as a side interest for my entire reading career has been World War 2. When I say “my entire reading career” I mean that literally. The first book I remember reading was a book about battleships. I’d read the captions over and over. Later, I picked up a book on the Bismarck, and my mom can attest to the fact that I read it over and over. I think the Library just let me check it out again and again. Anyway, I did trail off reading about WW2 through college, but recently I’ve started again. 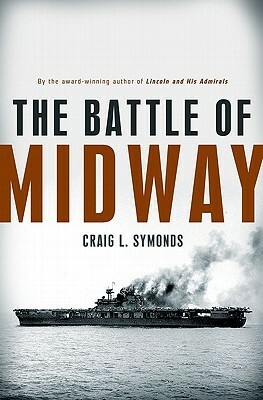 I picked up the aptly named The Battle of Midway by Craig Symonds. Now it is interesting to consider the divergence in historical accounts of this famous battle. Symonds notes that there was a widespread “supposition that the American victory at Midway was the product of fate, or chance, or luck, or even divine will” (4). In contrast, Symonds argues that while chance played a role, “the outcome of the battle was primarily the result of decisions made and actions taken by individuals who found themselves at the nexus of history at a decisive moment. In short, the Battle of Midway is best explained and understood by focusing on the people involved” (5). These two ‘schools’ of thought in a sense represent broadly two competing strands within historical research. One group focuses upon the events, while the other group focuses upon the people who make history move. This is, of course, a great oversimplification of historiography, but it is one that I’ve run into time and again. I tend to think the approach Symonds endorses is more realistic. Events like the Battle of Midway don’t just happen; rather, they are the results of a long string of decisions and movements that have brought one to such a turning point in history. I want to briefly highlight a couple areas from the Battle of Midway as a case study for this historiographic approach. First, “Operation K” was intended by the Japanese to provide information about whether or not Midway was as open for invasion as they thought. The Japanese intended to send a flight of scout planes via submarine to check on Midway. But when the submarines arrived at the point at which they were to refuel the plains, there were a few U.S. warships stationed in the lagoon. Now an event-focused approach to history might explain this as mere luck, or tie it to the fact that the Japanese had done a similar mission earlier which had alerted the U.S. to the necessity of defending this lagoon. But an action-focused approach would tie it not just to the events but also to the decisions of the commanders. Japanese Admiral Nagumo, upon the failure of Operation K, simply went on with the assumption that the United States was not anticipating a strike at Midway. A more prudent decision may have been to send submarines to scout Midway itself, or to simply call off the attack for the moment. Similarly, the fact that the American dive bombers found the Japanese aircraft carriers at the exact moment they needed to in order to strike hardest may be attributed to luck on an event-based historiography. But it is clear that while perhaps some luck was involved, the decisions of Nimitz and others opened up the possibility for this fortuitous event. For they had decided to send in the U.S. planes without waiting for them to form up. That meant that the dive bombers, fighters, and torpedo planes often arrived at the target at different times instead of together. But this, in turn, meant that the Japanese CAP (Combat Air Patrol) was off shooting down U.S. torpedo planes when the dive bombers arrived. Had Nimitz et al. decided to wait for their flights to form up, they would have met with a more unified defense from the CAP. Now I’m open to correction on these points of course, I’m no expert on naval history, but what I hope this post has done is to demonstrate that a historiography that takes into account the actions of people rather than merely the occurrence of events has better explanatory value. Does this preclude the involvement of luck or even divine intervention in history? Certainly not. What it does, however, is provide a more thorough account of those things which historians can more easily investigate: the decisions and actions of people during the largest moments of their lives. Craig Symonds, The Battle of Midway (New York, NY: Oxford, 2011).